I recently found Vogue 1179 on ebay (now OOP) after wanting it for awhile, so indulged and it was a worthwhile investment. As per my last post I have made two of these, the first in a teal jersey and immediately a second version in a geometric print. I have some photos of the second one here to show you. 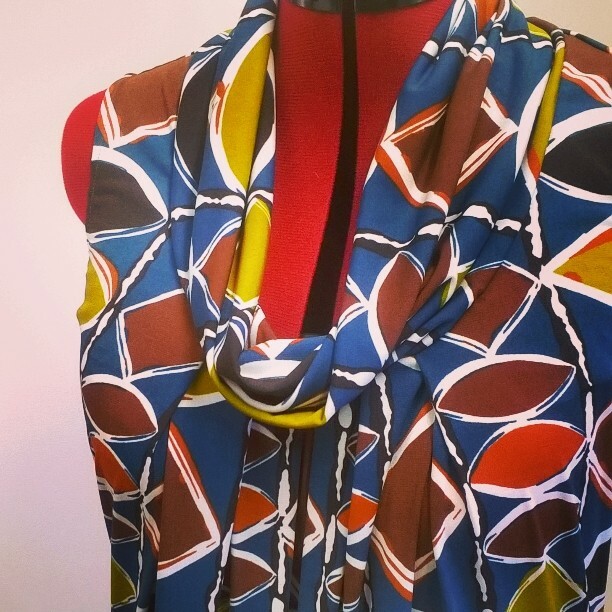 The geometric print is a fabric I bought quite awhile ago and even though the colours are great for me, the print is a little large and imposing so it has been hard to find a pattern that I thought would work for it. I am super impressed that this one works really well with it. I choose one pattern size down from what was recommended by the Vogue size chart. The main adjustment to the pattern was to increase the armhole size (by scooping it out at the bottom and taking that line back gradually to the armhole line near the shoulder.) I also added 2" to the length as I prefer it to just cover the knee (and not be above the knee). This fabric was very soft and spongy and when I put it on Diana (my dressmaker's dummy) before adding the collar, it seemed to instantly stretch at the front neckline with all the weight of the pleats. So I quickly whipped it off and spent a night sleeping on it to work out how to ensure the neckline was not going to stretch out after adding the collar (more weight). I ended up basting some clear elastic to the neckline just inside the seam allowance, so when the collar is sewn and overlocked on, the elastic is enclosed in the overlocked seam. BTW - I did what a lot of other reviewers did and just folded the collar wrong sides together and attached directly to the neckline instead of the multi-step process Vogue uses. I also did not use elastic in the armholes, but just turned and sewed a narrow hem twice. A really simple, quick make that gives you a easy to wear and stylish little frock I reckon. A lovely dress. 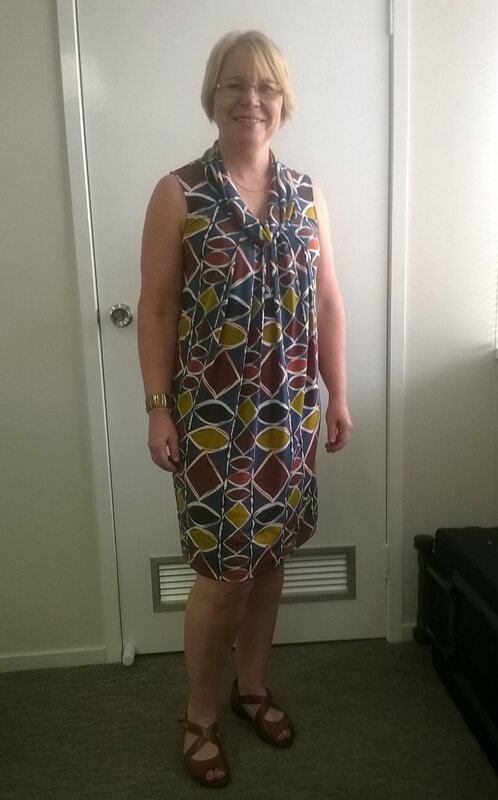 One of my favourite patterns and I have always found my version to be surprisingly slimming! I agree this is a great pattern. I made one in pre-blog days, but turfed it out due to inferior fabric. Thanks for reminding me of its existence in the stash! I think the print on this suits you really well, too. You look fantastic in this dress Sue. The style is very flattering and the print is perfect. I must look for this pattern. I love the way the lines on the fabric make the front of the dress look. Great fabric choice for this pattern. Plus who doesn't like geometric prints? Looks great on and a terrific tip for the neckline... I've put that in my memory bank. The style and colours in this dress suit you perfectly. Very nice! I love this pattern too and have made it several times for summer, and for winter in merino to wear with a top underneath. I am making it soon in red tartan to wear to the Edinburgh Tattoo in Melb in Feb. This is a great dress for this fabric! Turned out lovely. Looking good Sue! Your fabric works well in this pattern. I am looking forward to making this pattern up too. Beautiful! It looks so good on you! really like the fabric in this version. Great combo of pattern and print. And a nice solution at the neckline to counter all the fabric weight. Looks really nice on you! Very nice! Good use of the print. Hello Sue, this is lovely on you, in fact it sent me on a little pattern hunt when I had intended to visit here to answer your question about the stretchtex titanium on my old post about Ottobre exercise gear. It's been a terrific fabric, heavier than supplex, almost a cotton-like hand and has hardly pilled at all. Those exercise bottoms are only just wearing out now, and they've had some hard use. Thanks for the reply. I think I will give it a go. This dress seems to look great on everyone and you are no exception. I also thing that the print works perfectly here, I often buy prints that I love and then get stuck deciding what to do with them. I live in Toowoomba Queensland Australia with my husband and two sons. I have a part-time job but spend most of my time on my hobbies - sewing and fitness.